If you follow me on Instagram, you’ll have seen that our lovely wedding invitations arrived from Minted last week. Ahhhh!! * excited wedding dance * B and I were super on top of things and somehow managed to stuff, stamp, and post all 60 wedding invitations within 24 hours of their arrival. Now that the cat’s out of the bag for friends and family, I wanted to give you a peek at our invites, as well as offer some help – because selecting the right wedding invitations can be tricky! Unless you’re a Hallmark veteran, you’ll find yourself turning to the internet for the silliest of questions. Do I spell out the date? How do I address my 65-year-old aunt who lives with her long-term boyfriend? Do I need reception cards? Our day is really laid back, does the invite have to be formally worded? Could I make my own invitations? Where is the best place to order them? Seriously, there’s a lot to consider, so let me help you by putting all of the invite smarts in one place – a simple, wedding invitation crash course. Wedding invitations are important. They’re the first point of contact many guests have with your big day, and are an introduction to how the ceremony and reception will unfold. They tease expectations and share essential information. Chances are they will hang proudly on a fridge, so you’re going to want them to look nice, but you also want them to feel unique and special to you. Wedding invitations rally excitement, but more importantly, give practical information that will allow your wedding guests to have a smooth and memorable celebration. 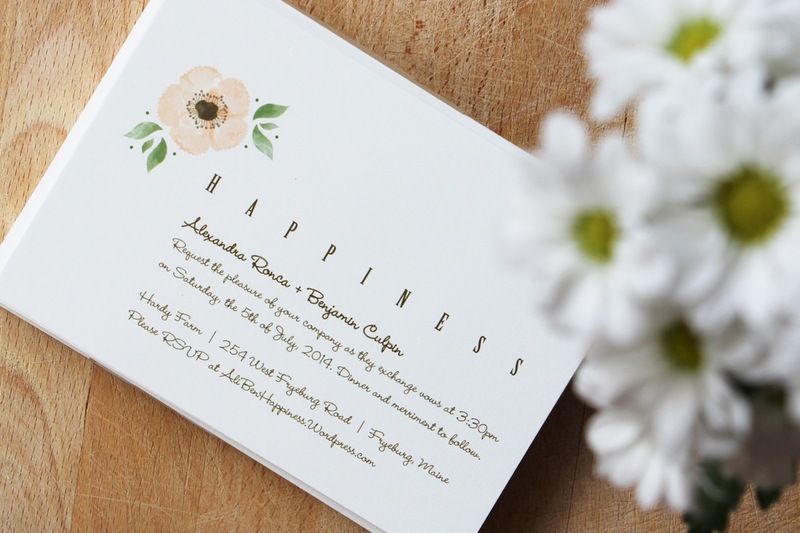 To perfect your wedding invitations, there are five important points you will need to consider. Style – Style is the look and feel of your invites. Are they DIY or professionally done? What are the colors? Are they post cards? Traditional thick card stock in white envelopes? 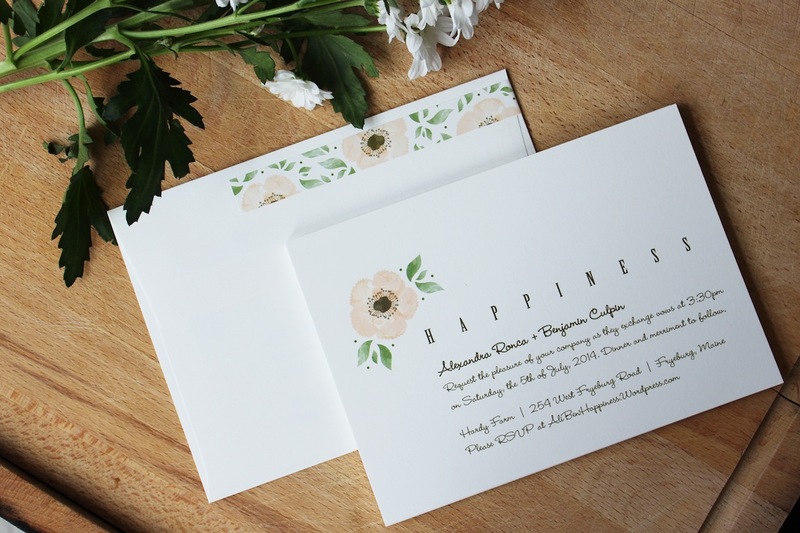 Vendor – Finding the right vendor is next on the list, and this involves choosing the right people to help you make your wedding invitations, whether it’s the guy at the paper store or an online Etsy shop where you purchase ink and a custom-made stamp. Wording – Next you’ll need to consider the wording and etiquette – how do you invite people to your big day? What language and tone do you use? Are you formal or playful? Sassy or sweet? Extras – Once you’ve perfected your invites, you’ll need to consider extras – special stamps, reception cards, menu cards, purchasing thank you notes or special envelopes. Delivery – Last on the list is delivery – how do you address your envelopes? What’s the etiquette around spelling out guest names? When do you send out your invites? And who to? This list might sound daunting, but your overall wedding theme, guest list, and budget will effortlessly guide many of the decisions you will have to make. So before we jump into thinking about invitation style, think about who is invited to your wedding, how much money you have to spend on invites, and what the overall look and feel is for your wedding day. Grab a piece of paper and make note. Once you’ve jotted down these initial considerations, keep them in mind throughout the invitation process – they will help guide your decisions and make selecting the right invites easy! Now let’s start to think about style. Before you start to think about where you will get your wedding invitations, you will need to decide what you want your wedding invitations to be. Are they big, small? Magnets, paper? Black, white? Silly? Serious? 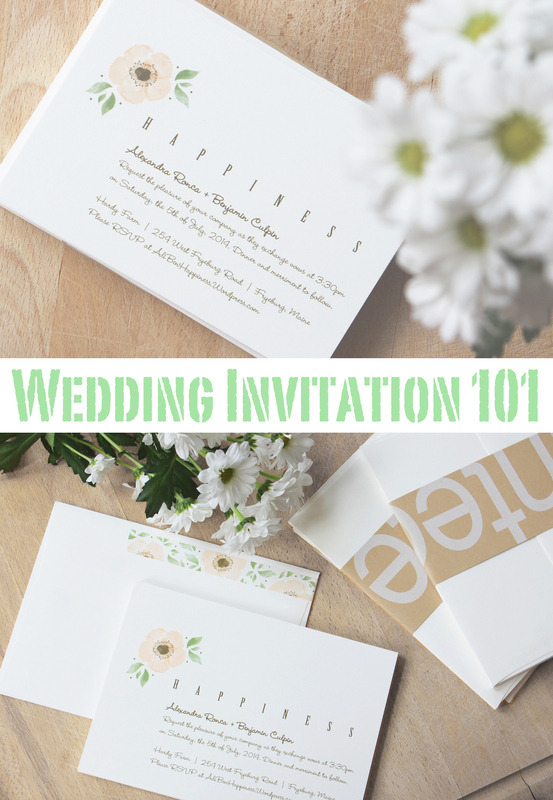 Tip 1: Use the overall theme of your wedding to guide your invitation style. For example, B and I are having a summer evening garden wedding, with soft peach colors and pops of gold. My wedding dress is ivory over gold, tables will be decorated with mini peach carnations in golden vases, and we will eat dinner in the cool evening air in the garden. My dress is a formal gown, and B will be wearing a kilt. We will have a bagpiper, but we will also have cocktails a plenty and a DJ who will play in a white-washed barn until the early morning hours. So our wedding is a blend of formal and playful, with a beautiful (and hopefully dry!) summertime backdrop. 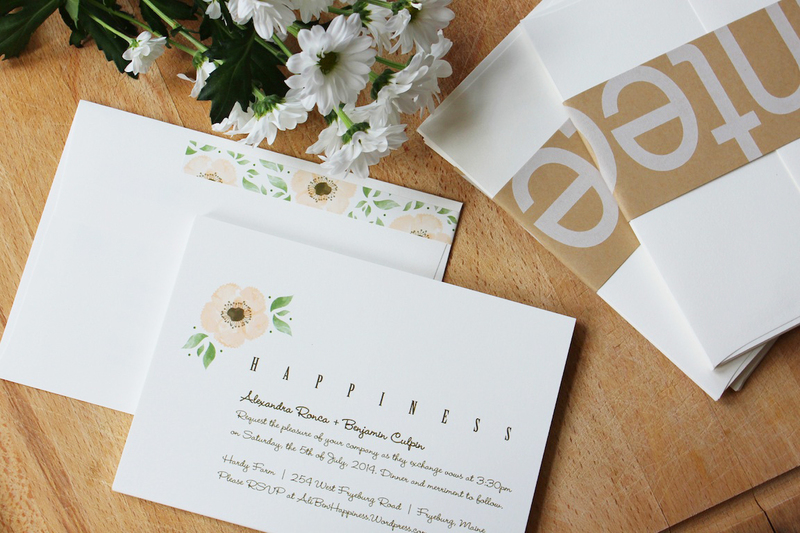 Using your overall wedding style as a guide, consider your invitations. Getting married on a rooftop? Maybe your invites depict a city skyline. Tying the knot on a farm? What about something more rustic? Graphics, in addition to card stock can help convey a particular style. If your wedding is fresh and modern, you could use thick, recycled paper with bold, letter pressed words. Tip 2: Your overall budget will also help drive your invitation style. I used Minted and spent about $200 on 65 invitations, including printed envelopes, return address stickers, and shipping (to my house in the Netherlands). We didn’t do anything super fancy, and we even passed on the gold glitter envelope inserts (more on these later). So I would say we spend a moderate amount of money, but got a product we were really happy with. If you’re on a budget, there’s no reason you can’t print your invites at home – this is in fact an awesome way to save some money! But keep in mind that buying envelopes, ink, and paper costs money, and said errands take time. B and I went the DIY route for our Save The Dates because I fell in love with a custom stamp on Etsy (you can read my Save the Date post here) but ordering the stamp took time, buying the paper and envelopes cost money, and by the time we had stamped 100 save the date cards, waited for them to dry, and stuffed and addressed envelopes . . . we were questioning why we didn’t just order them pre-made online!! Before you go the DYI route, map out your expected costs and factor in your time. Is it worth the savings? You don’t have to do what everyone else is doing. Maybe you and your fiancé are literature nerds and instead of sending an invite, you send a page from your favorite book with a stamp of your wedding date, time, and location. Or maybe he’s musical and you’re easily embarrassed, and you send out a digital wedding invitation with him singing an embarrassing song about your wedding day in public. You don’t have to follow trends or a set rule when it comes to wedding invitations, so be unique and be you, and your guests will be delighted. I’ll keep this section short because it’s fairly straight forward. Once you’ve decided on the style of your wedding invitation, you’re going to need to pick a vendor. Who helps produce your invitations? Even if you’re making your invites at home, you’re going to need to head on over to Staples and pick up some card stock. Think back on the style you have just selected. Now start doing some internet research on a good partner who can help bring your vision to life. I’m pro-digital for wedding invitations. If you work with a reputable online invitation shop, you can usually co-create your design, spell out the wording yourself, send an e-mail copy to your mom and five of your best girlfriends to make sure everything is spelled right. By ordering invites online, everything is written down in black and white, and in my opinion, there is less room for human error! There’s also more room for your input and customization along the way. Tip 5: Work with trusted vendors. Zazzle – Before a friend whispered in my ear about Minted, I was very close to ordering invites on Zazzle. They have a HUGE selection, however their invitations are slightly more image-based than Minted. They’re also a bit more expensive. They have a huge range, and you can search by size, cost, and template. Etsy – Wedding planning has sparked my love for Etsy, and their wedding invitation department is no exception! Here you can buy artwork (if you’re a DIY gal) or you can order custom made invitations. There are some beautiful designs, and even better, by shopping on Etsy you are supporting a local artist. Good feelings, and good invites. Win-win! Tip 6: Etsy has it all! Planning something different? 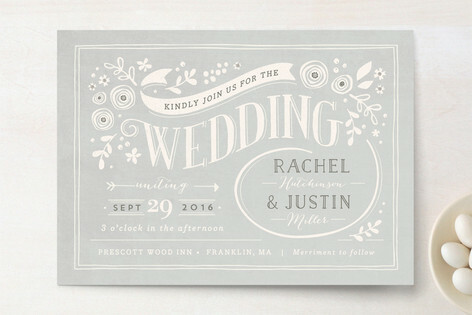 I know I just told you about Etsy for traditional wedding invitations, but they’re also a great resource for finding alternative wedding invites. Custom made stamps? They got ’em! Movie ticket wedding invitations? Yep! Bunting wedding invites? So adorable! Unique card stock for printing? They have that too. Tip 7: Choose your favorite design, and test it. Once you’ve selected a vendor, browse through their selection, keeping the style you would like in mind. Choose your top five favorite designs, and then share them with your partner. Together, decide on your top two choices. Then, share your top two favorites with a friend or acquaintance. Ask for their first impression – this is a great way to test how your family and friends will react when opening their invites. Ask them what kind of vibe they get from your invite. Is it the same as the style you chose? You don’t get to see your guests open the invites, so it’s a good idea to get a second (or even third) opinion before progressing forward with the details. It’s important to select a design before you map out wording, because some designs can be quite restricting in regards to space. The design B and I chose had enough room for three lines on date and time, and one line for location. Not a lot of room, but enough to work with. By choosing your invite first, you’ll know how much wiggle room you have for wording. Once you have this done . . . Tip 8: Choose your tone. Remember when you jotted down the style and overall theme of your wedding? Was it formal? Casual? Playful? Fun? You’ll want the tone of your invite to reflect the style of your wedding, so your guests get a good indication of what to expect at the ceremony and reception. B and I chose to have the word “H A P P I N E S S” spanned across the top of our invite. Because the most spectacular part of our day will be having both of our families (who are from different parts of the world) together in one room. And we are SO elated by this! Our one wedding wish is for everyone to come together and celebrate, and be happy! We chose to keep the rest of our wedding invite wording casual and fun. We are getting married in a barn, after all! Think about the vibe of your wedding day and translate this into tone of your invitation. Are you having a very formal church ceremony, followed by a six course dinner at a swanky hotel? You’re going to want a formal tone to match. To find the right tone and wording, I recommend browsing through wedding invitations online, and writing down key phrases and words you like. Then craft this into invitation copy that is unique and right for you. Tip 9: Remember the mandatories. There are things guests will need to know about your wedding. Some mandatories should be shared on the invitation, while other pieces of information can be communicated on accompanying reception cards or special direction cards, or evening on a unique wedding website. But what are the mandatories that need to be spelled out on your wedding invitations? Well, let’s start with the obvious. You’re going to want to include the bride’s name and the groom’s name. Also, be clear that it’s a wedding ceremony their invited to, and if a reception will follow, you’re going to want to spell this out as well. This may sound obvious but if you’re having a shower, a rehearsal dinner, a bachelorette, and a Sunday breakfast, you’re going to want to be very explicit in detailing which invite is for what event. You’re also going to want to include the where and when – the date of your wedding, the location, the venue or church name, and the hour. And lastly, tell your guests what they’re required to do next. Do they need to RSVP? Then include an RSVP card or a website where they can RSVP. Should they find out more on your wedding website? Then include this URL. This is the bare minimum. Guests may also have questions around directions, transportation, accommodation, dress code, etc. Don’t lasagna this onto your wedding invite. It’s a reminder, not a magazine! There’s a time and place for these extras and we’ll get there later. Tip 10: Don’t mention the registry. Tip 11: Choose the traditions you feel comfortable in upholding. Did you know there is an etiquette around how you’re supposed to phrase your wedding invitations? Traditionally, you should spell out numbers in the date. For example, instead of saying Saturday the 5th of July, 2014, you should say Saturday, the fifth of July, two thousand and fourteen. Also, it’s considered good form to spell out numerals when telling time. So if your wedding is at 5pm, it’s appropriate instead to say five o’clock in the evening. Try to avoid saying AM or PM, and instead stick to in the morning or in the evening. The phrase the honor of your presence should be used when the ceremony will take place at a house of worship. For other venues, the pleasure of your company is the traditional wording. That said, we didn’t do any of this. Whoops! It didn’t feel me, it didn’t feel B, and it felt forced. Our wedding will be quite laid back, and that’s the tone we wanted to convey on our invitations. We also avoided mentioning our parents on the invitations. Tradition dictates that if Mom and Dad are paying for the wedding, they should be the ones inviting your guests to the to the celebration. More detail on that here. I personally think this is the worst rule ever. Why would we word our wedding invitations in a way that it announces who is paying for the party? This seems antiquated, and not our style at all. Keep in mind that rules are made to be broken, and at the end of the day it’s important to do what feels right for you, your partner, and the style of wedding you want to have. Once you have selected the style, vendor, specific design, and copy for your invitation, you’re going to want to consider the extras. Extras are all the bells and whistles you might want to include in addition to your basic wedding invitations. Tip 12: Think budget, then think extras. The best way to select your ‘extras’ is to think back on your budget. Once you’ve priced out your basic invitations, assess your budget to see what kind of wiggle room you have left. Maybe you really, really want gold polka-dot lined envelopes, and lucky you, there’s $200 left in the wedding budget to order your dream envelopes. Tip 13: Consider what invitation add-ons are right for you. There are many add-ons to wedding invitations, some more necessary than others. Here’s a list of some of the more popular options. Premium Paper – Do you upgrade your paper? Want a thicker stock or something more shiny? Consider a premium finish or card stock. Direction Cards – Do you want to give your guests more details on how to get from the ceremony location to the reception? Direction cards are a great idea! Reception Cards – If your ceremony is at a different time and location than your reception, then you might want to include a reception card to tell guests when and where the second half of your wedding celebration will commence. RSVP Cards or Postcards – How will guests tell you they are coming to the event? You could set up a wedding website, or you could include an RSVP card or post card for guests to mail back to you with their attendance reply. RSVP cards are also a great place to ask guests about menu selection if you’re serving a formal meal. Thank You Cards – If you plan on sending thank you notes to your guests after the wedding (which you really should) you can order matching card stock so your thank you notes are coordinated with your invites. Invitation Silhouette Shapes – Want a cute, curvy invitation? 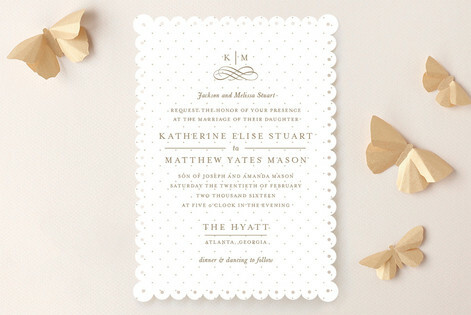 It might cost more than a simple square-cut invite, but it’s a great way to add some attitude and style to your invite. Printed Envelopes – Don’t want to hand write 100 addresses? Consider getting your envelopes pre-printed with your guests’ addresses. Printed Return Address Labels – Again, if you want to save some time in writing your return address on 100 envelopes, then consider purchasing pre-printed return address labels. This is also a great way to add some color to the outside of your envelope. Slip-In Envelope Liners – A great way to add some color to the inside of your invitation envelope. RSVP Stamps – Special stamps, customized to match your wedding stationary. Save your guests on postage and ensure your RSVPs are returned. Ribbons or Belly Bands – A great way to decorate your invites. Mini Cards – Often in the form of a hang tag, mini cards can be strung from your invites – a great way to ensure your reception cards and invitations do not get separated. Embossers & Seals – Decorative add-ons for the outside of your envelopes. 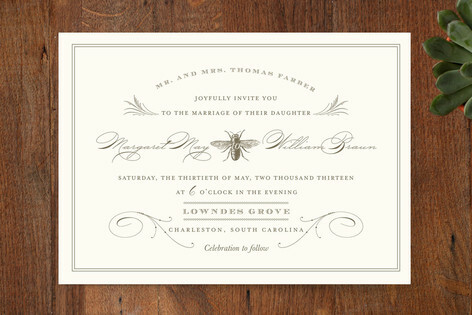 Custom Type, Letter Press, or Calligraphy Text – A fancy way to make the copy on your invites more premium. 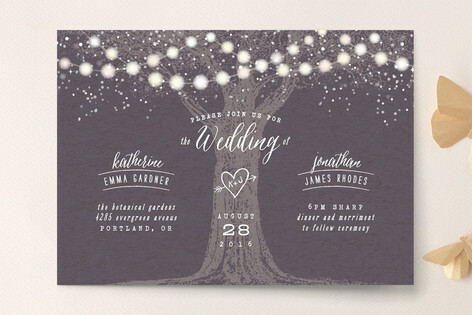 As you can see, there are many possible additions for your wedding invitations. Think about the information that is most important to communicate to your guests. Do you have a very strict RSVP deadline? Then include RSVP cards and call out this mandatory deadline. Is your ceremony location an hour’s drive from your reception venue? Then you will most definitely want to include direction cards for your guests. Consider the top information your guests will want to know about your wedding, and use the invitation as a segue into sharing this information. Once you’ve ordered your invitations, you’re left with the task of addressing and mailing them. Similar to the wording on your invitations, there is an etiquette involved in how this is done. Tip 14: Names are important. Real Simple does a fantastic job of detailing how to address your guests, and instead of reiterate everything here, I highly recommend checking out their site. B and I both used it as a guide, as it explains the best way to address that awkward single aunt, or the couple living together for 45 years who aren’t married. Names are very important to people, so this is one aspect you do not want to stuff up. Share your invite list with a few close family members to do a double check on spelling, and then use the Real Simple guide to be sure you are addressing your guests appropriately as you spell out their address on the envelopes. Tip 15: Timing is important. If you’ve already sent out a save the date, then it’s OK to send out your wedding invites three to two months before the actual wedding. If you’re not sending out save the dates, you will want to send out your invites sooner, and if you’re getting married locally and have a tight-knit community of family and friends, it’s OK to push delivery a tad later. Overall, it’s polite to give guests a good heads up of your big day, especially if they will need to arrange hotel, flights, or any other kind of rentals. Consider how you typically arrange your travel plans. You don’t book a plane ticket one month before the flight – the prices are the highest at this time! Help your guests manage their time and money, and send out your invites within a courteous time frame. Wedding invitations are a huge undertaking, although they’re just one small part of what will make your celebration day special! Here are a few more parting tips. * Bring your invitation suite to the wedding so your photographer can capture your beautiful invites. * Set a date for guests to RSVP by. B and I forgot to mention this on our invites. We’re only inviting 100 guests, so making a few phone calls the week before the wedding wont hurt us, but in hind-sight I wish we had remembered to do this! * Order a few extras incase you spot a misspelled name or address. * Don’t use the phrases such as No Children or Adult Reception. If children are not invited, simply omit their names from the addressed envelopes. And lastly – have fun!! This shouldn’t be painful. Have a glass of wine, brows around online, chat invite options in the park with your love. Wedding planning is as fun or painful as you make it, and the experience will be shaped by your mindset. So enjoy yourself, and good luck! How do I get the honey bee invite you have pictured? Thanks. are renting a facility such as a hall for the wedding, how much space do you need to get.